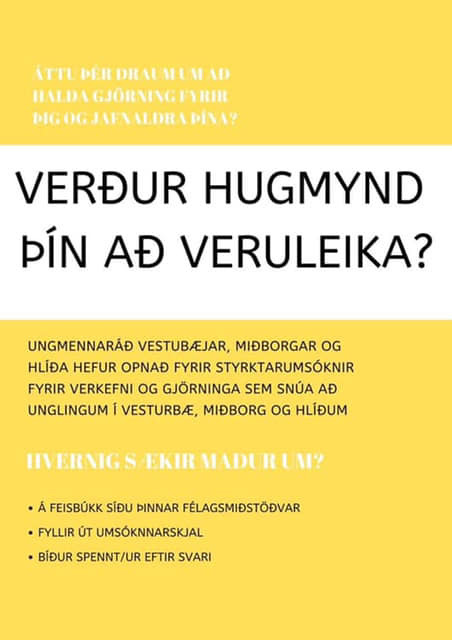 Verður hugmynd þín að veruleika? // Will your dream become reality? Home » Verður hugmynd þín að veruleika? // Will your dream become reality? Ungmennaráð Vesturbæjar, Miðborgar og Hlíða hefur opnað fyrir styrkumsóknir! Þau vilja styðja unglinga í að láta hugmyndir sínar verða að veruleika. Styrkir til ungmenna eru hluti af frístundstefnu Reykjavíkurborgar þar sem sérstaklega á að huga að því að hvetja til þátttöku, sköpunar og betra samfélags. 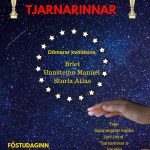 The Youth Council of Vesturbær, Miðborg and Hlíðar has opened applications for grants. The Council wants to support young people’s ideas become reality. Grants are part of the City’s Recreational Plan where a key goal is to encourage participation and creativity for a better society.